Learn about the newest trends and best practices in IT Systems Management to make your life as IT professional more effective and grow your business. · The latest information on per-user pricing models and monthly fees charged for emerging Cloud services such as backup, email, private Cloud, etc. Plus, every attendee will be entered into a random drawing to win a £100 Amazon Gift Card during the webinar! Join this webinar and learn why consistency is the hallmark of an effective, agile organisation. With thousands of moving parts, ensuring that every user, every system is being managed consistently is critical. This webinar will show you how a best practice IT systems management software effectively defines, manages, applies and enforces IT policies across groups of machines. A state-of-the art Policy Management system streamlines the process of creating, setting and remotely applying IT policies to groups of systems across a distributed organisation. Administrators need to be able to view all policies from a single dashboard, customise them and assign them based on organisation, group, machine type, platform or any dynamic view of machines to ensure all systems are in compliance. By automating management by policies and enforcement, administrators can then take immediate action to remediate any system that is not in compliance. Align your IT services with company goals through an automated process and policy-driven approach. Modern Service Delivery solutions provide you with the tools your IT organisation requires in order to transform from a reactive to a proactive delivery model. Regardless of the size of your business now you can experience the rewards in operational productivity and increased profitability through IT automation. By implementing a comprehensive and integrated solution with the power, flexibility and scalability to meet your needs today and expand as your business grows, IT automation enables a pro-active approach to improved operations and customer satisfaction. From Software Inventory to Remote Desktop Management, companies can get the tools, technology and resources that make complete IT automation possible. BYOD is a critical component of leading companies’ IT offerings today, giving employees the freedom and satisfaction of working on the devices that they prefer. Organisations implementing BYOD require a means of ensuring corporate control and security of enterprise data and applications, while also meeting employees’ demands for freedom from enterprise constraints on their personal device. A modern BYOD suite delivers on all of these requirements by securely extending corporate data sources to mobile users’ smartphones and tablets. By offering the ability to control corporate data and applications within a containerised application on the user’s device, a BYOD solution provides IT departments with an enterprise-class, highly secure means of delivering real-time integration between mobile devices and back- end systems. Automation is a key factor in the delivery of successful IT services as you can create and automate services on demand, while focusing on strategic priorities. Through client and server side scripting along with scheduling across the entire solution, IT automation provides pro-active service delivery capabilities that result in increased productivity, consistent service levels, maximum utilisation of staff and expanded service capabilities while obtaining a rapid return on investment. A state-of-the-art software solution can integrate and automate service management and quality control of the IT services and processes that your business depends upon on a daily basis. ITSM should be focused on service design, operations and delivery so that your employees can evaluate opportunities for improvement throughout the service lifecycle. Consolidate and standardise your service desk and supporting processes such as incident, problem, change, asset, configuration, release and deployment management. 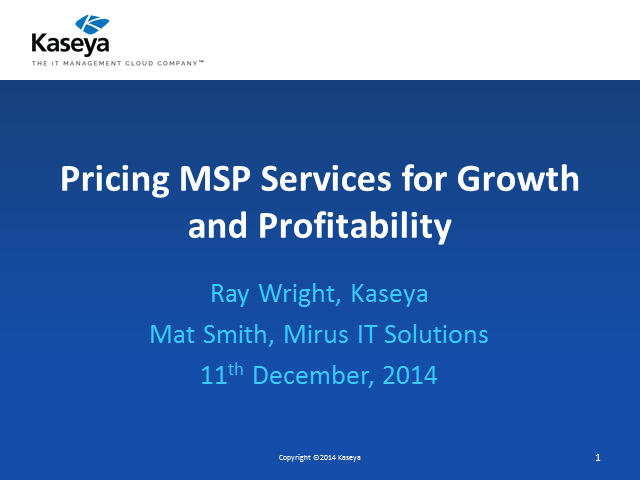 Join Chris Brightwell from Kaseya in his webinar and discover how an IT systems management software can make your work as IT professional more efficient and what a state-of-the art solution can do for you and your IT. Did you know that natural disasters, such as hurricane or flood only account for approximately 2% of all business disasters while hardware failures and human error account for more than 70%? Let’s face it: as an IT professional, anything that interrupts normal business operations could form the basis of disaster for you. Just remember: whatever the cause of your interruption, how you prepare to respond that will decide the fate of your business. Watch this webinar with Dr Daniel Hidlebaugh, Director of ILT at Milton Keynes College, who has implemented Kaseya to manage 2,500 endpoints at the College. Learn what challenges Dr Hidlebaugh had faced before he implemented the Kaseya solution, why he chose Kaseya to manage his IT infrastructure and what results he achieved. Organisations, both large and small, public and private, UK-based and international—are facing unprecedented challenges in an effort to support critical business initiatives in today’s dynamic business environment. Users are now distributed, mobile and technology savvy. They bring their own mobile devices to the workplace and expect quick and efficient IT services and support for those systems. It’s the Wild, Wild West out there and IT teams are expected to bring law and order to the table in order to protect and secure the organisation while supporting the changing needs of each user. While seemingly counter intuitive, organisations can actually create IT efficiencies without having to cut service levels by adopting a systems management strategy that embraces the concept of “Discover, Manage, Automate and Validate”. Managed Services require a clear and consistent proposition. Is your IT business consistently winning new customers from your key target list? Or are you winning too few new customers to meet your growth aspirations? Are you finding it difficult to win enough of the right kind of new customer – at the right price? Paul Fileman and Adam Harris from Transmentum will outline the steps you can take to build and then deploy a powerful value proposition that your Managed Services sales team can leverage to win more of the right kind of new customer – in line with your IT business growth plans.